My EUR/USD positions are doing well, but I think it’s time to protect my profits ahead of the monster NFP reports. As you can see, the pair is currently finding support at the 1.1850 handle after bouncing from the 1.1900 resistance. Looks like the trend is still my friend! But with the much-awaited NFP report coming up, I’ve decided to tighten my stops to lock in my gains. See, analysts like Forex Gump have pointed out that risks to tomorrow’s jobs reports are skewed to the upside. This is good news for dollar bulls out there who have been eating the bears’ dust for the past couple of weeks. 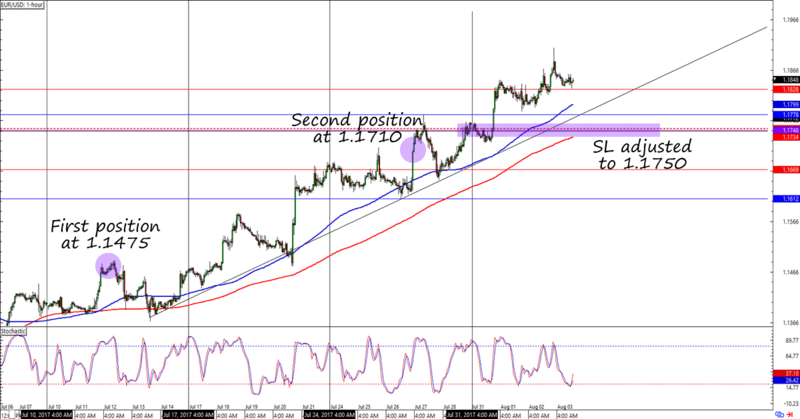 I’ve placed my stops at 1.1750, which is already below the 100 SMA and rising trend line on the 1-hour time frame. I’m planning on tightening my stops further just before the actual release, though, just to avoid losing some of the gains this trend trade has made. Moved all stop losses to 1.1750, which gives me a total gain of 310 pips (+0.62%) if the adjusted SLs get triggered. Of course, I’ll also be watching the event for opportunities to press my trend trade if the NFP report ends up disappointing expectations or pushes EUR/USD for whatever reason.